All aboard the "Lenin" icebreaker and paying respect to the heroes of WWII at the Alyosha Monument. Murmansk, or “Monamourmansk” as the locals affectionately refer to it, was the last city to be founded by the Russian Empire but, nonetheless, it has a very turbulent and important history. During the entire Great Patriotic War, Murmansk heroically withstood the German offensive against the city that began in 1941 as part of Operation Silver Fox. The city suffered extensive destruction, the magnitude of which was rivaled only by the destruction of Leningrad (now St. Petersburg) and Stalingrad (now Volgograd). This unyielding, stoic resistance was commemorated at the 40th anniversary of the victory over the Germans in the formal designation of Murmansk as a “Hero City” on May 6, 1985. Due to the very action-packed program of the first two days, we had virtually no time to discover the city of Murmansk itself. It was time rectify that. We had a few hours before our flight back to Moscow. 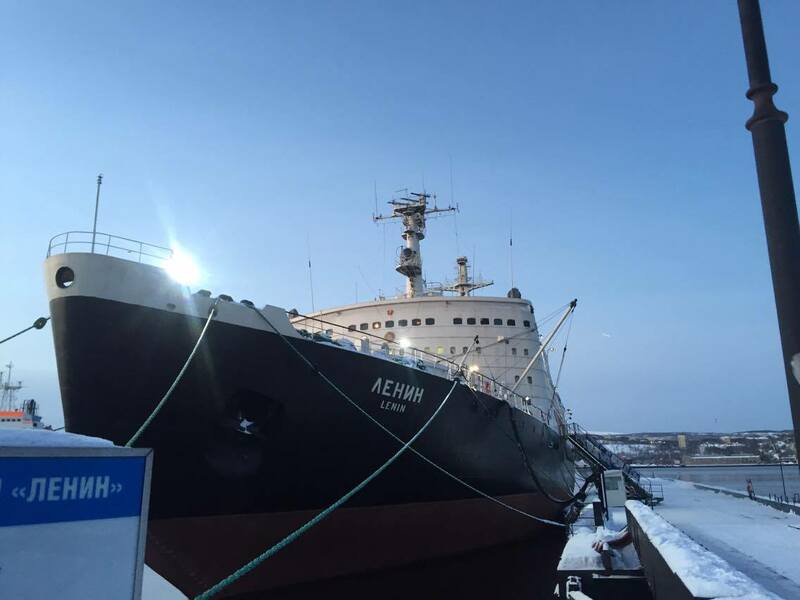 A trip to Murmansk would not be complete without visiting the famous “Lenin” nuclear icebreaker. Launched in 1957, the “Lenin” was both the world's first nuclear-powered surface ship and the first nuclear-powered civilian vessel. It entered operation in 1959 and worked clearing sea routes for cargo ships along Russia's northern coast until being decommissioned in 1989. Now, Murmansk’s port is the icebreaker’s final resting place and it was opened to the public in the form of an interactive floating museum in 2005. Our guides from the previous days told us that there was one tour guide who is basically a walking encyclopedia and if we were lucky enough for it to be his shift on the visit, we’d have the most interesting tour one could have of the “Lenin”. I really wish I could recount all the fascinating information this knowledgeable, mild-mannered old man imparted on us but that would require another 10 blog entries, so I’ll try to be rather brief and selective as to what we saw and learned about. The icebreaker has more than 1,000 and it is very easy to get lost – even for those who work there. The icebreaker, they say, was built by the entire country: 510 organizations around the USSR worked tirelessly to supply all the material, parts and other things that were needed to get it up and running. Altogether, from start to finish, the “Lenin” was completed in a record time of 3 years and 3 months! The Soviet leadership cut no costs when it came to the legendary vessel. The entire interior – from the captain’s quarters to the bedrooms of ordinary sailors – was fitted with wooden paneling to create a sense of being on land and close to home. On average, there were about 150 people on board the “Lenin” at any one time during the years of its exploitation. One of the most interesting places on board the “Lenin” for me personally was the hospital. For those who were stationed in the Arctic the “Lenin” was a lifesaver in the most literal sense of the word. The Arctic is probably one of the most remote and harsh work environments on the planet so if someone got sick even with something as routine and curable as appendicitis, it would in most cases mean certain death. The “Lenin”, however, always had a helicopter on board which would either fly doctors to where they were needed or get the patients to the icebreaker’s modernly equipped hospital for more serious procedures. The chief doctor who worked aboard the Lenin throughout its exploitation is still alive and well and lives in Murmansk. He must have quite a few amazing stories to tell! One of the rooms even boasts the original 2014 Winter Olympic torch, which was taken all the way up to the North Pole on board the modern nuclear powered icebreaker “50 Years of Victory”. After its very successful round trip to the North Pole, the Olympic torch was respectfully presented to the museum of the original nuclear icebreaker – the “Lenin”. This marvel of engineering, the pioneer that opened up Arctic routes, in its long and impressive history experienced great moments and played host to a whole raft of high-ranking personalities. For example, Fidel Castro’s first visit to the USSR after the Cuban Revolution started in Murmansk and, of course, he had a look around the “Lenin”. Yury Gagarin, the first man in space, was also fond of the vessel and the Kola Peninsula in general. The interactive part of the museum lets you get up close and personal with the history and the inhabitants of the Arctic – kids often take a selfie with a polar bear there. In addition, the positioning of the icebreaker offers some unique views of Murmansk from the communication controls room. We were also taken around the icebreaker’s nuclear room and turbine power plant. It was all really informative and fascinating. No wonder that since its conversion into a museum, the “Lenin” has received more than 250,000 visitors. Upon exiting the icebreaker we saw something truly amazing in the skies above our heads: it seemed like the Aurora Borealis had come out to play for a bit during the day! Perhaps it wasn’t the Aurora Borealis – I am no meteorologist – but the colors and movements we saw in the sky were truly captivating. We looked like real tourists among the locals who just kept walking past calmly, spoiled by such displays in the winter. The second and last stop before the airport was Murmansk’s other main noteworthy sight – the Alyosha Monument. This inspiring wartime monument, also called the “Monument of the Defenders of the Soviet Arctic during the Great Patriotic War”, commemorates those who defended the port of Murmansk during World War II. The statue is of a soldier in a greatcoat with a rifle slung over his shoulder. The height of the pedestal is 7 meters and the statue itself is 35.5 meters tall, making Alyosha the second-tallest statue in Russia, after The Motherland Calls in Volgograd. Alyosha stands at the top of a hill, which means that quite an impressive view of the port city of Murmansk opened up before us. Just as we started setting off towards the airport, the clouds started sprinkling large fluffy snowflakes as a way to bid us farewell and a safe journey. Although very short and very sweet, these three days provided a pretty great little introduction to the Kola Peninsula. Had we had more time, it would have also been great to visit the magical Khibiny Mountains and get my snowboard out at the Kirovsk ski resort. Oh well, I know for sure there will be in a next time in this incredibly beautiful part of Russia!